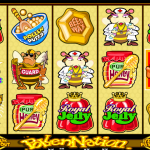 Pollen Nation is a Microgaming slot which takes you deep into the bee hive. Here you will have a chance to see the everyday life of the bees, run by the Queen Bee. You can see all of the hard working bees going out and collecting pollen. They turn the pollen to sweet honey and they have to make enough to last them through the winter. This is an older slot so the animations aren’t on the top level. Still the symbols are well designed and the colors are vibrant giving the slot an attractive look. The Wild symbol in Pollen Nation is the Queen Bee and she awards a top payout of 6.000 coins for 5 of a kind wins. She will also substitute for all symbols except the scatter and bonus symbol. The Scatter Bee symbol can also land on all of the reels, but he doesn’t trigger any bonus feature. He only offers a payout of up to 80 x stake if 5 of them land anywhere on the reels. The only bonus feature in the game is a cash pick and win bonus. It is triggered by landing 3, 4 or 5 Babee Bonus symbols anywhere on the reels. The player is then taken to the beehive where you need to make picks from a number of honey combs. Each comb will award a coin prize or the Stop Sign. Once the Stop sign is revealed the bonus round ends and the payouts are added to your balance. Players can win up to 32.500 coins in the Babee Bonus Game. Pollen Nation is a cute and fun Microgaming slot which will interest you at first sight. This is a low variance slot so it’s great for bonus wagering and gradually increasing your balance. If you’re a fan of the Greek Mythology then you should consider playing Mount Olympus a 5 reel slot by MicroGaming.